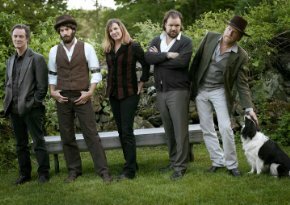 RAY LAMONTAGNE and the PARIAH DOGS – If music is the soul of mankind and a man needs to mellow out his soul, then Ray LaMontagne and the Pariah Dogs are a band to drift off to. With that said, anyone who really knows Stone, realizes that besides being a Metalhead-Rockaholic, I’m also an admirer of quality music of any genre. Doesn’t the word “genre” come across as intellectual sometimes? It is a “must” word to use when you have a blog about… music. I’ve never been bashful to use this word, Metal be thy name. 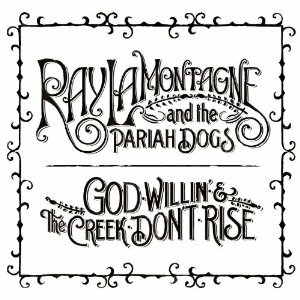 Well… onward to Ray LaMontagne and the Pariah Dogs album – God Willin’ & The Creek Don’t Rise. 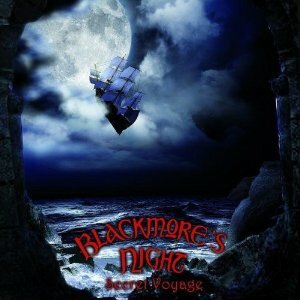 There are those moments in my life where I turn to some good old fashioned Easy Listening music to chill out my senses. Why do I need to “chill out my senses”? Really, I don’t have a clinical answer for this, other than soothing sounds of music and vocals can relax me and make me look at my life from a different angle. The vocals of Ray LaMontagne I find to be somewhat captivating, it’s almost as if he sings the way he damn well feels and never gave a damn about trying to fit in with any specific group of contemporary male vocalists. Besides being the vocalist for his band The Pariah Dogs on this album, Ray LaMontagne also plays acoustic guitar and harmonica. The acoustic guitar can justifiably emit as distinct and powerful a message through it’s tone as it’s muscular counterpart… the electric guitar. Soft Rock or as it’s also called, Easy Listening, has always benefited from the mellow side of an acoustic guitar. Folk Rock’s foundation is centered around the acoustic guitar and this new Ray LaMontagne album exploits the easy listening sound of Folk Rock to it’s ultimate potential. Ray’s vocals and the acoustic guitar are like soul mates to one another, the combination of the two brings about reflections of what the song is conveying lyrically as well as emotionally. As I listen to New York City’s Killing Me, the mental imagery of the New York City sky-scape stays with me. I see the subway, crowded streets and Summer time smog as Ray sings about how this city is killing him. I love New York City myself, still I can understand how some visitors to The Big Apple could easily not become acquainted with it’s social pace and maximized energy. God Willin’ & The Creek Don’t Rise has a Pedal Steel played by both Eric Heywood and Greg Leisz, it’s a sound that just hits me perfectly. I just seem to experience that “open country field” feeling while listening to this song, the Pedal Steel only helps to interpret this all the more for me. Beg Steal Or Borrow is as blatantly fabulous of a song as there could be on this album. The tempo, beat and totality of sound resonating from The Pariah Dogs reminds me of an early ’70’s Fleetwood Mac. I can easily understand there being some Fleetwood Mac influence within the musical veins of Ray LaMontagne or any of his band members. Are We Really Through is a somber ballad that is about… breaking up with someone. Ray’s vocals on this sad sounding song has an unbelievable Joe Cocker quality. Trust me, Ray LaMontagne is no copycat vocalist to my ears. Just think for a second as to how difficult it would be, to even try to sing like the legendary Joe Cocker. The vocals of Ray LaMontagne spill over these songs, as natural and free as a waterfall spilling over moss covered river stone. Often times, the word “unique” is overused, therefore, I shall state Ray’s vocals are stunningly unique. To think that maybe Ray LaMontagne is a fan of Neil Young’s Harvest album is a credible thought. The mellowfied Country Rock that sticks it’s happy face out during this album during such songs as Old Before Your Time and For The Summer, comes as a welcomed listen for my retrospective ears and thoughts. These two songs would have been a smash for AM radio back in those satin days of the ’70’s. The interesting aspect of Old Before Your Time and For The Summer is that they are realistically relevant now. Like Rock & Roll And Radio opens with Ray playing the harmonica, setting the stage for what I would consider his best vocals on this album. Ray is a storyteller and he tells stories through his songs like he has been doing this for decades. There are moments when I have to look at the liner notes of God Willin’ & The Creek Don’t Rise, look at the photos of Ray and make sure he’s not a legend from the early ’70’s. Devil’s In The Jukebox is a glistening finish to an album that was already glistening. The back country woods sound, feel and foot stompin’ character to this song makes it a prize worth listening to repeatedly, making me wish this song would just carry on for another five minutes or more. It’s quite obvious that Ray LaMontagne has a skilled band of musicians behind him. The Pariah Dogs compliment Ray’s vocals as if it was meant to be and it was written to happen this way, hundreds of years ago, on a scroll. Not to sound as a wise guy here, yet as I listen to God Willin’ & The Creek Don’t Rise, the feeling that overrides me from these ten songs are that of AM gold. These songs, practically this entire album is one big hit. If I am to point out one song that doesn’t “do it” for me, it’s Are We Really Through. Regardless of how I feel, this sad song might just touch someone differently with it’s meaning. These are the songs that I don’t mind hearing while taking a long ride in the country or while reading a good book. To listen to this album while sitting on my back patio and staring up at the blue Summer sky, while looking over my gardens and enjoying a couple of cold brews, is on my to-do list. * God Willin’ & The Creek Don’t Rise was released on August 17, 2010, on RCA. This album is the fourth studio release for Ray LaMontagne and first album being named alongside his band The Pariah Dogs. After just one listening experience with “Influence” (released March 6, 2007) and you hear and feel the unique musical chemistry, that both Tommy Shaw and Jack Blades have together. The overall up beat vibe throughout “Influence” will have you not putting this disc away for a very long time. What an accomplished set of Classic Rock gems that Shaw-Blades covers! Typically, I always approach cover songs with skeptical tendencies. Usually one or two listens to a cover tune, will be enough of a listen for me to either like it or cherish the original version. With “Influence”, I was taken completely by surprise by how Tommy Shaw and Jack Blades brought new Rock life to these classics. While I listen to this album, I cannot help but go through a Rock and Roll reality check, realizing where the roots of Rock music actually come from. The Mama’s and the Papa’s, Simon and Garfunkel and Seals & Crofts may have their legacies emblazoned in the Rock Folk and Easy Listening genres, yet their lyrics, song structures and melodies can so easily be considered the building blocks of true Classic Rock. Tommy Shaw and Jack Blades took hold of these musical building blocks and ran with it… creating a sensational album of Classic Rock, that breaks down any generational barriers that carry the tags of dated and non-relevant. I used to never care for “The Sound Of Silence”, now I cannot wait to listen to the Shaw-Blades version. These guys have taken “Summer Breeze” to an entirely different Rock level, making it seem that much more alive and vibrant. Tommy Shaw sings lights out on “California Dreamin”, having the void of not having a female vocal anywhere in this tremendous song, seem totally appropriate. (However, there will always be only one Mama Cass Elliot). “Time Of The Season” gives me the chills no matter how many times I listen to it, the vocal harmonies and overall musical arrangement and tempered up-tempo of this Shaw-Blades version hits home. “Lucky Man” is an abbreviated version of the original, Shaw-Blades treat this masterful song with the upmost respect. “I Am A Rock” is covered here with a dose of more energy than the original, making it sound even more inspirational the second this song begins. I obviously have fallen head over heels for “Influence”, this is one disc that will lift your spirits in a good old fashioned, Classic Rock way. All fans of Tommy Shaw and Styx, Jack Blades and Night Ranger have to positively, absolutely, add “Influence” to their music collection. Shaw-Blades have proven to me that they are a class act and stand alone musically. If their musical talents on “Influence” do not blow you away, their vocals surely will. It is not the easiest of tasks to take on so many revered Rock and Roll classics and cover them for a sound that rings of relevancy. I always stand up for Rock and Roll, no matter how far back the roots may lie. If it was not for these legendary bands of yesteryear, along with their brilliant songs, where would any of todays Rock genres be? I live by the credo – know your roots and know where you came from… this holds true for the music I love as well. Tommy Shaw and Jack Blades have proven to me over the years they are unique and outstanding musicians. On “Influence” they have done it again, while also upholding the respect and reverence for the history of Rock and Roll.